The Masjid-e-Nabvi and the Kaaba Sharif are under threat! Free Makkah Sharif! Free Madina Sharif! Free Hejaz! We Indian Muslims denounce the deadly attack on 4 July 2016 near the tomb of Prophet Muhammad (Peace Be Upon Him) in Madina and have passed a resolution of consensus that Hejaz should be freed from the control of Wahhabi/'Salafi' Saudi dictators. It is tragic that Makkah, the birthplace of the Prophet and the direction of prayer for all the world's Muslims, is in the hands of a small, fanatical, barbaric and obscurantist cult. The Wahhabi band of zealots invaded the holy city in 1924 after which they forced the inhabitants to submit to the Wahhabi creed. Those Muslims who refused to convert to Wahhabism were put to the sword. Many Sunni Sufi scholars were killed and Sufi books burned. It is important to distinguish between Wahhabis and the Sufis, who are the true Sunnis. The Wahhabi cult was founded in the province of Najd by a feeble-minded preacher named Muhammad Ibn Abd al-Wahhab in the 18th century CE. He declared that both traditional Sunnis and Shias were non-Muslims and had to be forcibly converted to Wahhabism. The cult of Muhammad ibn Abd al-Wahhab was despised by ordinary Muslims. If he had used only peaceful means the cult would probably have disappeared after his death. The reason Wahhabism managed to gain influence was not because of its pervasive power but because of Ibn Abd al-Wahhab's alliance with the warrior Abdelaziz Ibn Saud. Through terror and bloodshed they weakened all other forms and interpretations of Islam in the Arabian Peninsula. According to Wahhabism, only Wahhabis are true Muslims. Ibn Saud used the Wahhabi creed as a pretext to kill and rob Muslims. Muslims have to realize that the continuing Wahhabi occupation of Makkah is damaging our religion, our values of universal compassion and love, our cultural heritage and our public image. Ancient tombs and beautiful mosques have been destroyed to give way to luxurious, vulgar hotels and shopping malls. The ongoing horrendous sacrilege being committed by the Wahhabis is without the consultation and permission of the various Islamic nations. They do not care about the sentiments of the world's Muslims. They act as if Makkah belongs to them and is their personal family property. In the same way that Abdelaziz Ibn Saud used the Wahhabi cult with a license to kill and plunder, his descendants on the Saudi throne use the same creed to justify the destruction of Islamic tombs so they can build commercial centers and lavish five-star hotels for profit. More than 98 percent of the Kingdom's historical and religious sites have been destroyed since 1985, according to the U.K.-based Islamic Heritage Research Foundation. When the American pastor Terry Jones burned Qur'an, we Muslims protested. Why don't we protest against the Wahhabi destruction of the grave of Hazrat Khadija? Why don't we protest against the barbaric suicidal inhuman attack in Madina Shareef? · The Wahhabi occupation of Makkah and Madina must end. It is a disgrace. · The heart of Islam has been hijacked by a fanatical and extremist cult. It is time we launch a worldwide movement for the liberation of Hejaz. · Sufis from across the world should come together for this purpose. We should demand that control over the holy Islamic sites and heritage be taken away from the Wahhabi regime and collectively administered by an International Islamic Council. · Makkah and Madina are sacred to all Muslims and should reflect the diversity within the Islamic community. · The council would be responsible for managing the pilgrimages and should make sure that all Islamic schools of thought are respected. · Sufi mosques and centers of learning should be established in both Makkah and Madina. · Sufi Muslims cannot be trampled upon day in and day out and remain silent forever. · History has proven that Sunnis and Shias can live together in peace. Wahhabis can not. · They have to go now. · Free Makkah Sharif! Free Madina Sharif! Free Hejaz! 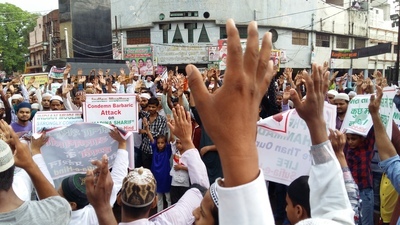 Protest at Kanpur, Uttar Pradesh, India, 15 June 2016.